ColorBar makes managing large filing systems less labor intensive and virtually eliminates misfiled documents. Integrate ColorBar labeled folders into your current filing system with exact visual and color match, or create a new filing system tailored to your organization's needs. 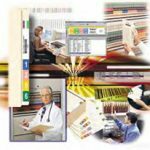 ColorBar is a perfect solution for high-volume filing departments or any company that wants an easy way to generate color coded files on-demand. You can customize and print a variety of label shapes, sizes, and colors quickly and easily with ColorBar Design-A-Sheet labels. Our Design-A-Sheet label program gives you the flexibility to create and print multiple label styles for any application. Create your own combination of end tab labels, top tab labels, bar code labels, document labels, address labels, or labels for any other office need. Using your custom layout, we die cut letter size label sheets to give you the exact label size you need for your specific requirements. 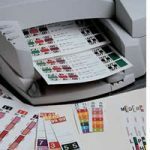 Colorbar Design-A-Sheet labels provide unmatched flexibility for your specific filing needs. Order label sheets die cut into virtually any shape and any size up to 8 x 10-1/2 inches. Your minimum order of 1,000 sheets includes the die, die cutting, and die maintenance for future orders. Perforation and hole punch options are also available. All adhesive products have a limited shelf life. We recommend that you purchase only the quantity that may be used within 12 months of purchase. Be sure that any color comparison or matching is performed on the actual label stock to be used for production. Color variations can and do occur when printing onto stock provided by several manufacturers. Smead Software Solutions is not responsible for color fastness, color matching, or the adhesive properties of third party suppliers. Use only genuine ColorBar labels for conversions and day forward applications.